“When I was in elementary school, the other kids would always joke around whenever my name was called. ‘Reema, sing!’ they would yell”, expecting her to sing a song each time. 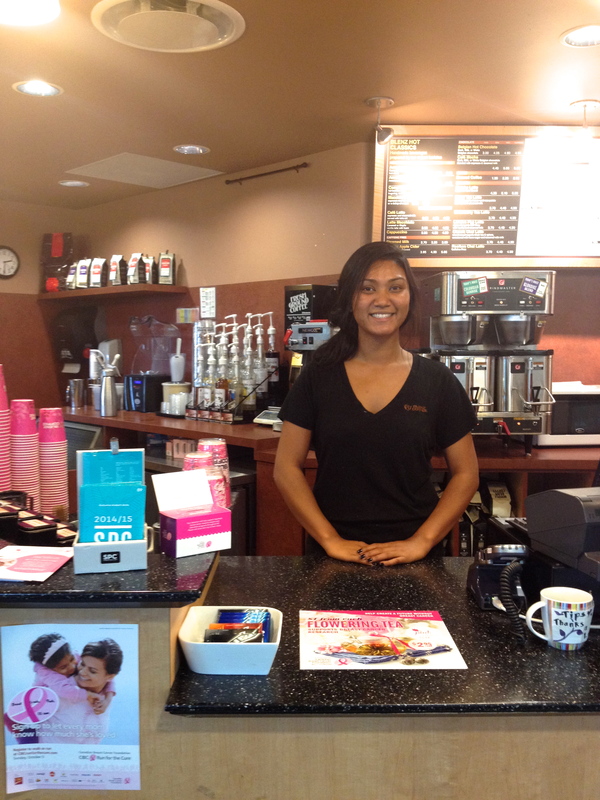 Right now, Reema works full time at Blenz café at SFU Surrey. She’s working toward upgrading her courses so that she can go to school to become a nurse. Working full time at a coffee shop was supposed to be a “meantime” kind of job, but she told me about how so much good has come out of it. “I met my boyfriend while I was working here”, she said. He would come to order coffee from her every day, and she would smile at him. “Then, one day, he was coming down the escalator. We smiled at each other and that’s when I knew I liked him”, she said. In her free time, Reema likes to play video games and basketball. She also likes to rollerblade. She recently bought a pair of rollerblades for $7 at a thrift store and absolutely loves them. “I don’t know how to stop yet, though”, she said with a tone of caution in her voice. She told me about a time when she was rollerblading down the sidewalk. There was a big group of people walking slowly in front of her and because she couldn’t stop, she just dove onto the grass nearby. “Are you okay? !” they asked her. She told them she was fine but they helped her up anyways. She’s still learning but is having a lot of fun along the way and thankfully, she has the great gift of being able to laugh at herself. Her boyfriend just bought a pair of roller blades too, so that the two of them could go roller blading together. But he had been keeping a secret from her: he didn’t actually know how to rollerblade. The first time they went rollerblading together, he fell down the hill. “It’s like he thought I wouldn’t eventually find out that he didn’t know how”, she said, laughing. Her advice? “Listen to yourself”, she said. She explained that by taking her time to figure out what her passions were, and by listening to her inner voice, she was able to discover that being a nurse is what she wants to commit herself to. She shied away from the prospect of this for the longest time, because her mom is a nurse, and she thought she was just blindly following in her mother’s footsteps.Her mom is from the Philippines and her dad is from India. Upon further reflection, Reema explained, she realized that nursing is actually something she would enjoy doing. “Don’t forget to listen to yourself”, she said once more.